Neil Dawson, prominent New Zealand sculptor, was commissioned in 2012 to design the award Category Trophy and Supreme Award Trophy. 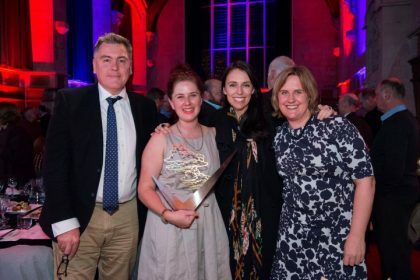 2016 Supreme Winners from the Arts Centre are pictured with the Supreme Trophy and the (now) Prime Minister Jacinda Ardern. Neil Dawson CNZM was born in Christchurch in 1948 and attended the Canterbury University School of Art from 1966 to 1969. He graduated with a Diploma in Fine Arts in 1970 and then attended the National Gallery of Victoria Art School. Dawson taught drawing and design at Christchurch Polytechnic from 1975 to 1983, but has worked in more recent years as a full-time sculptor. He has exhibited internationally, completing many large commissions, including ‘Ferns’ in Wellington, ‘Chalice’ in Christchurch, ‘Globe’ for the Pompidou Centre in Paris, and ‘Canopy’ for the Queensland Art Gallery in Brisbane. His largest work, and New Zealand’s largest piece of public sculpture, is the visionary six-storey-high sphere ‘Fanfare’ which sits by the northern motorway entrance to Christchurch. Originally commissioned by the Sydney City Council in 2004 it was suspended from the Sydney Harbour Bridge to mark the New Year of 2005. The City of Sydney donated it to Christchurch City in 2007 and it was restored and re-erected in 2015. Neil was awarded an Arts Laureate by the Arts Foundation of New Zealand in 2003 and made a Companion of the New Zealand Order of Merit in 2004.